We manage commercial food waste for a diverse range of industries. Try the toolkit below to find out if you could be our next customer. How many meeting & events / banqueting covers do you provide monthly? How many meals do you serve per day? How many residential students do you have? How many non-residential students do you have? How many meals do you serve daily? or how many meals do you serve per year? or how many visitors do you receive annually? What is your annual volume of food waste (Tonnes)? or how many employees do you have at your location? Do you segregate your food waste? How many food waste bins do you have? How often are they picked up per week? *If you use a 35 or 40 cubic yard dumpster, you will have significant potential for cost savings, green electricity production and CO2e reduction. The amounts will vary based on how quickly you fill up the dumpster and the type of food waste you have. Please call us and we will quickly complete the savings analysis with you. *If you use a 35 or 40 cubic yard dumpster, you will have significant potential for cost savings, green electricity production and CO2e reduction. The amounts will vary based on the proportion of food waste to other waste, the type of food waste you have and how quickly you fill the dumpster. Please contact us and we will quickly complete the savings analysis with you. How many prisoners do you have? Westquay South is the UK’s largest dining and leisure-led development. Cleone Foods is the UK’s largest manufacturer of Jamaican patties. Cargill Meats Europe is an international producer and marketer of food products and services. intu owns and operates shopping centres throughout the UK and Spain. The University of Wolverhampton’s Telford Innovation Campus is home to over 3,000 students. Jurys Inn Hinckley Island is a 362-room 4-star hotel in the Leicestershire countryside. 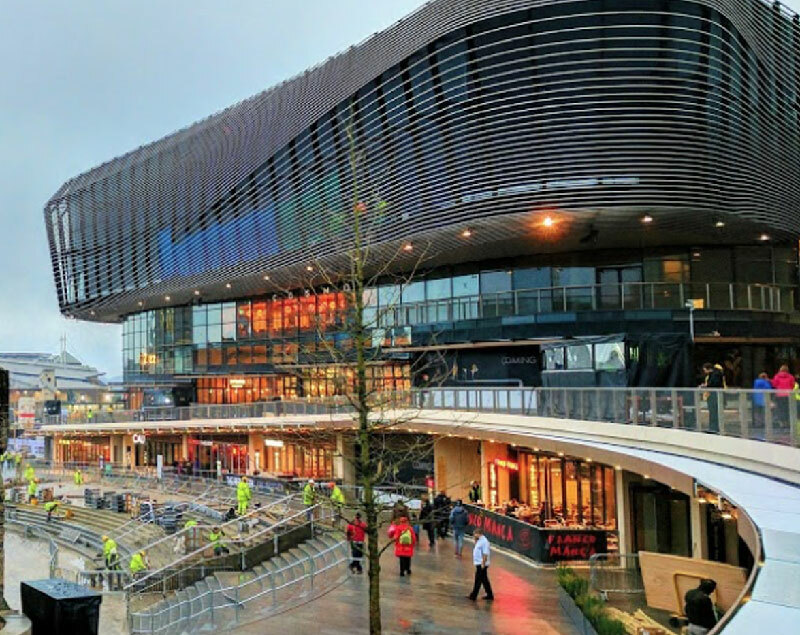 Westquay in Southampton is the UK’s largest dining and leisure-led development. The 93,500 square-metre complex was completed in late 2016 and is home to 25 restaurants. These are expected to generate over 100 240-litre bins of unavoidable food waste per week for recycling. Westquay is owned by Hammerson, whose portfolio includes 21 major shopping centres in the UK and France. Westquay’s building facilities provider is ABM. Both organisations are committed to the cost effective, socially responsible management of unavoidable food waste, with an emphasis on segregating this waste, then ensuring it is recycled. Typically, most shopping centres manage food waste by collecting it from restaurants and cafés to be placed in bins located in waste and recycling areas. Those bins are then wheeled to the centre’s service yard, where they are stored for collection. Even with daily pick-up, the large number of bins would occupy too much space. Pick-up frequency might interfere with truck deliveries. The annual 300-plus food waste pick-ups would increase both health and safety risks, as well as carbon emissions. OWL installed a standard-sized BioWhale, which can store the equivalent of 12 tonnes of food waste (or around 150 240-litre bins), yet has the footprint of just 10 wheeled bins. 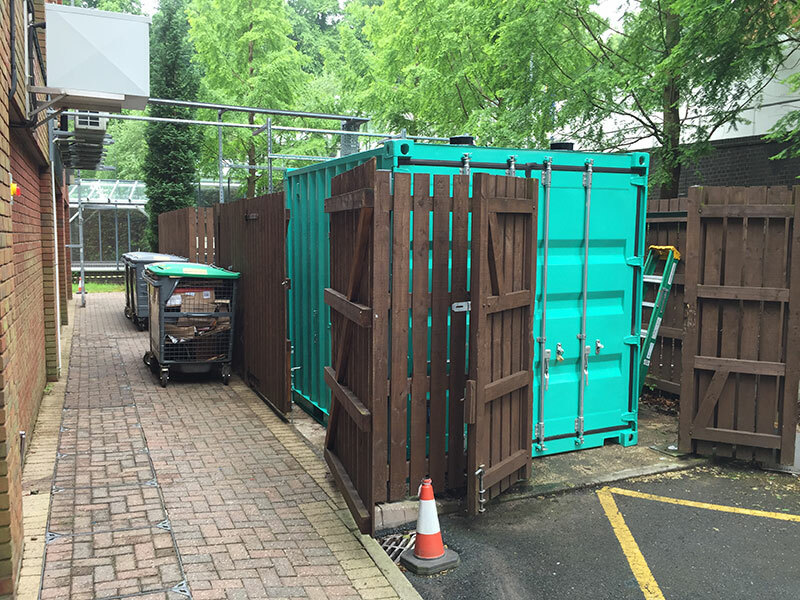 The unit was placed in Westquay South’s service yard, where the bins waiting for pick-up would have stood. Westquay South’s BioWhale was specially designed to meet the centre’s space needs. Conventional BioWhales have a steel hopper on the side, into which food waste is loaded. 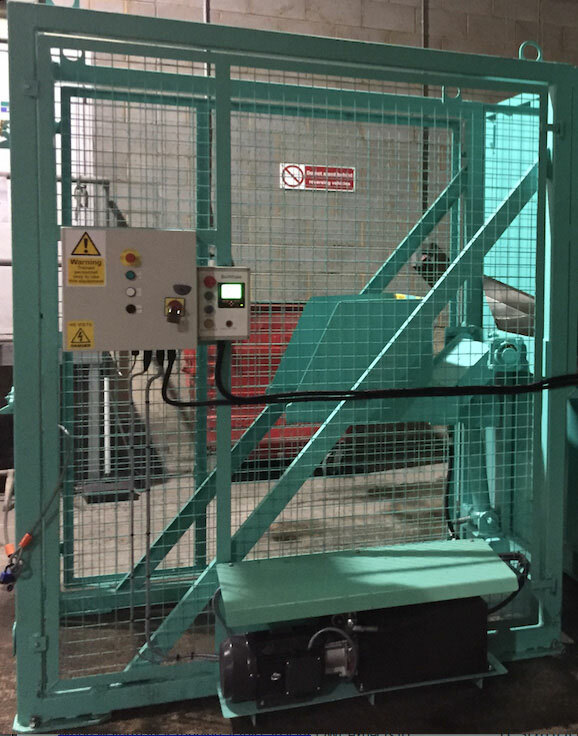 Westquay South’s unit has been designed to allow waste to be loaded from a raised loading dock, via a 120-litre bin lifter. Based on customer traffic in Westquay South, OWL expects to empty its BioWhale every 10 to 14 days. Odour-free and hygienic food waste collection – unlike bins, which can spill, and compactors, which can leak. Low risk of pests and vermin. Lower carbon emissions, due to over 80% fewer waste collections. Lower health and safety risks, thanks to far fewer waste-vehicle journeys. BioWhale allows Westquay to optimise limited recycling space. OWL’s solution brings stronger recycling and responsible business credentials. Like many of our users, Westquay South produces large amounts of unavoidable waste, and thus requires a bin lifter to load the hopper. This is positioned to load into top of BioWhale. Jeremy Neal of OWL and Wade Lyn, company owner and Managing Director of Cleone Foods, shake hands upon delivery of their Compact BioWhale. Cleone Foods is the UK’s largest manufacturer of Jamaican patties. Under its Island Delight brand, the Birmingham-based company – which employs 50 people – sells 100,000 patties each week to retailers, accounting for over half (55%) of the pattie market. Since 2009, Cleone has had a zero-waste-to-landfill commitment. It is a past winner of the HRH Prince Charles’ Responsible Business Ambassador Award and the Santander Responsible Small Business of the Year. Despite its strong green credentials, Cleone continues to seek out new technologies and systems which will improve its CSR programme. Cleone generates around 2.5 tonnes of unavoidable food waste a week, most of which is dough. In the past, this was collected in small plastic caddies in the production area and emptied into 15 large wheeled bins on the production floor. When full, these 110-litre bins were swapped for empty ones, and stored in an outside waste compound, ready for thrice-weekly collection. This process made it challenging for Cleone to maintain its exacting hygiene standards. Cleone was also concerned odours and occasional spillages might attract vermin to the bins compound. Plus, it felt freestanding bins full of food waste created an unsightly landscape for visitors. And so they approached OWL to assess whether its system could offer a cost effective alternative that would address their hygiene concerns. 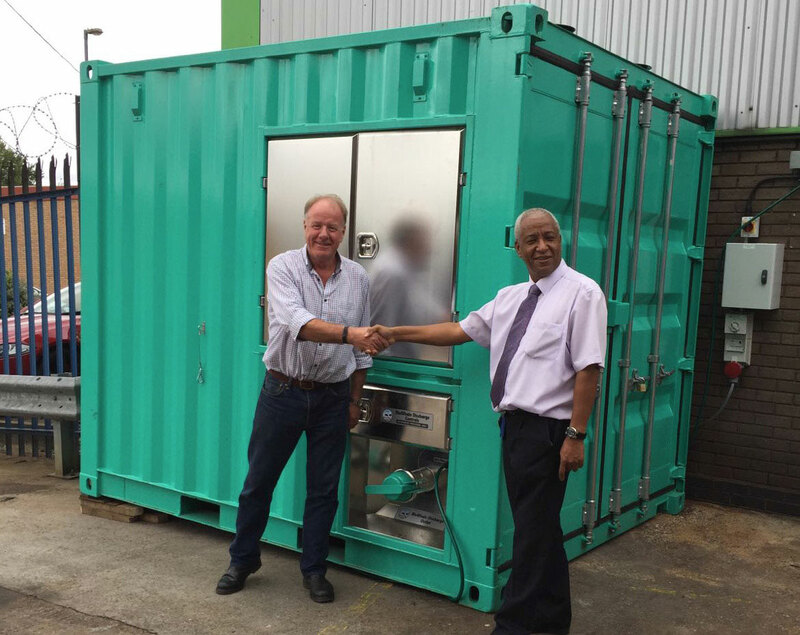 Cleone now uses a compact BioWhale, which can store the equivalent of 4 tonnes of food waste. Staff load waste into the BioWhale using easy-to-clean food-waste caddies. There are no spillages, nor odours. Easier-to-maintain hygiene standards in its production area. No more unsightly, malodorous wheeled bins that might attract birds, rodents, insects and other pests. A saving in CO2e emissions of nearly 500 tonnes a year, thanks to Cleone’s vastly reduced waste-collection requirements. The generation of sufficient energy through BioWhale- processed waste to heat 10 houses for a year. The enhancement of Cleone’s already strong reputation as an environmentally responsible business. Cargill’s Wolverhampton plant sits on a 13-acre site and has the capacity to produce up to 19,000 tonnes of product per year. Cargill Meats Europe is an international producer and marketer of food products and services. Cargill operates a state-of-the-art further chicken processing plant in Wolverhampton, producing breaded and battered chicken products for a leading quick service food restaurant chain. The 13-acre site has the capacity to produce up to 19,000 tonnes of product per year. Cargill is committed to sustainability, from farm to fork, constantly seeking better ways to minimise the environmental impact of its operations and supply chains. It is mindful, too, that commercial and industrial businesses in the UK food sector generate 2.8 million tonnes of food and drink waste each year, much of which ends up in landfill. Currently, food waste is segregated during the food manufacturing process and is transferred to stainless steel dolav containers that are housed away from production areas. 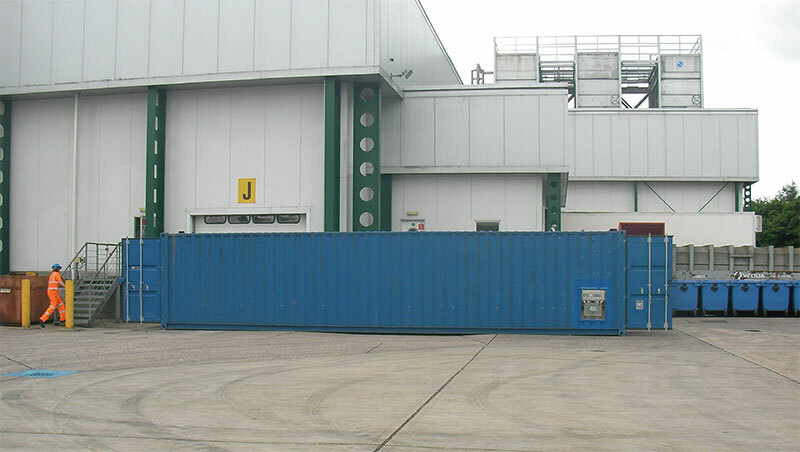 These containers are emptied into a skip located in a refrigerated storage area. The skips are collected daily and taken to an anaerobic digester. Cargill wishes to continue recycling all of its unavoidable food waste, but is seeking a system that will allow it to do so at a reduced cost. Refrigerating is costly, and is better suited to storing high-value products rather than waste. Skips cannot be filled to capacity, increasing pick-up frequency, so carrying a higher financial and environmental tariff. The current food-waste system is complex and significant worker involvement carries health and safety risks. Skips are difficult to clean. This can also attract vermin and carries a cross-contamination threat. OWL has installed a 24-ton Large BioWhale, located outside the Wolverhampton plant’s existing food-waste facility. Production waste is tipped utilizing the current dolavs from the containers to a bespoke hopper inside the production facility. Waste is transferred from the hopper to the BioWhale unit via stainless steel piping. This is the first time we have facilitated the transfer of waste from a production floor to the BioWhale without the use of a new bin lifter. OWL solutions are bespoke, as this is how we meet clients’ varying needs. No more waste refrigeration delivers energy and environmental savings. Refrigerated waste storage area now used for higher-value ingredients and products. No odours, messy spillage, nor overflows to attract pests or vermin. Fewer waste pick ups, cutting costs and reducing carbon footprint. BioWhale capture of the value of high energy content in the food waste stream. Telford Innovation Campus now uses a compact BioWhale to dispose of all unavoidable food waste from its busy canteen. Previously, waste was either stored in 240-litre wheeled bins (above) or ended up in the sewage system, via a macerator. The University of Wolverhampton’s Telford Innovation Campus is home to over 3,000 students. The focus of the campus is engineering studies. It also helps local start-ups, by providing business support services. The campus operates a popular central cafeteria. Previously, unavoidable food waste, from both preparation and cooked waste, was collected daily in free-standing bins with plastic liners. These liners were carried outside and stored in 240-litre wheeled bins, which were collected twice a week. In addition, food waste from the plate cleaning area was put down drains, ending up in the sewage system. OWL installed a Compact BioWhale in the campus’s waste and recycling compound. Cafeteria staff load the BioWhale at the end of each service, using 23-litre spill-proof plastic kitchen caddies. These are located in the food preparation area, as well in the dish collection-and-wash stations, and are easy to clean in the existing pot-washers. The Compact BioWhale can hold the equivalent of 4 tonnes of food waste, and so requires emptying far less frequently than wheeled bins, thus cutting the campus’s carbon footprint and bolstering its green credentials (Standard and Large BioWhales hold 12 and 24 tonnes respectively, so larger volumes can be easily accommodated). Macerated food waste is no longer put down drains, reducing strain on the sewer system. No more unsightly, malodorous, wheeled bins that can attract vermin and pests. BioWhale tank levels are remotely monitored through OWL's online system, ensuring on-time, hassle-free removals for the Campus. Fewer waste collections reduces the University's carbon footprint. Food waste is now 100% recycled, strengthening Telford Campus’ environmental responsibility credentials. The Compact BioWhale fits neatly into the University's existing waste storage area. With OWL’s help, Jurys Inn is seeking environmentally sustainable and cost-effective solutions to the management of unavoidable food waste. 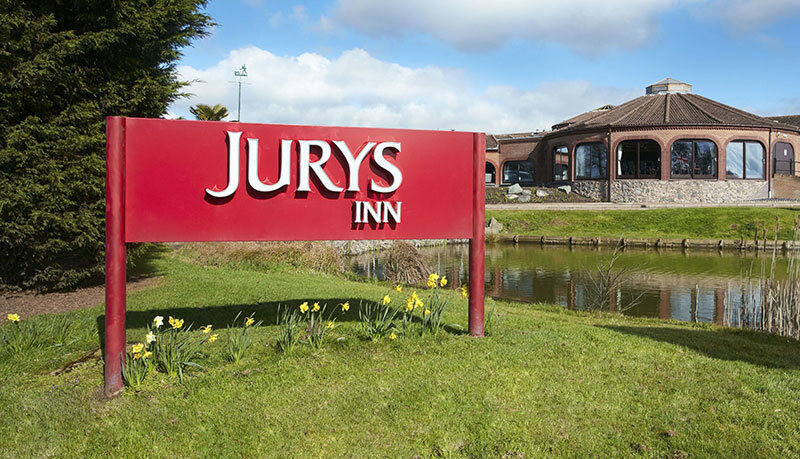 Jurys Inn Hinckley Island is a 362-room 4-star hotel in the Leicestershire countryside. It has a restaurant and an open eating area with a coffee shop, pizza bar and sports bar. It also boasts five function rooms, for catered events such as wedding, conferences, business networking events and product launches. The hotel currently recycles its glass but has no experience with food-waste segregation or recycling. It is now keen to explore environmentally sustainable, cost effective solutions for the management of unavoidable food waste, as well as recycling opportunities facilitated by the removal of food waste from their waste stream. At present, kitchen waste is placed in lined bins along with general waste. When full, the bins are taken to an on-site compactor, located in a waste processing area. Jurys Inn recognizes this is less than ideal; not only can spillages and odours attract vermin but disposal to landfill is costly, and has poor environmental outcomes. The management team is mindful, too, of the bigger picture: that commercial and industrial businesses in the UK food sector generate 2.8 million tonnes of food and drink waste each year, much of which ends up in landfill. 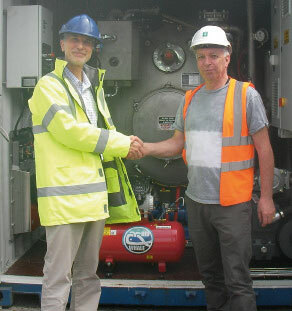 OWL installed a Compact BioWhale in the existing waste processing area. The BioWhale is loaded using 23-litre spill-proof kitchen caddies. These are carried to the BioWhale via trolley and then easily cleaned in a pot-washer. OWL’s system will also meet our client’s changing waste needs over time. 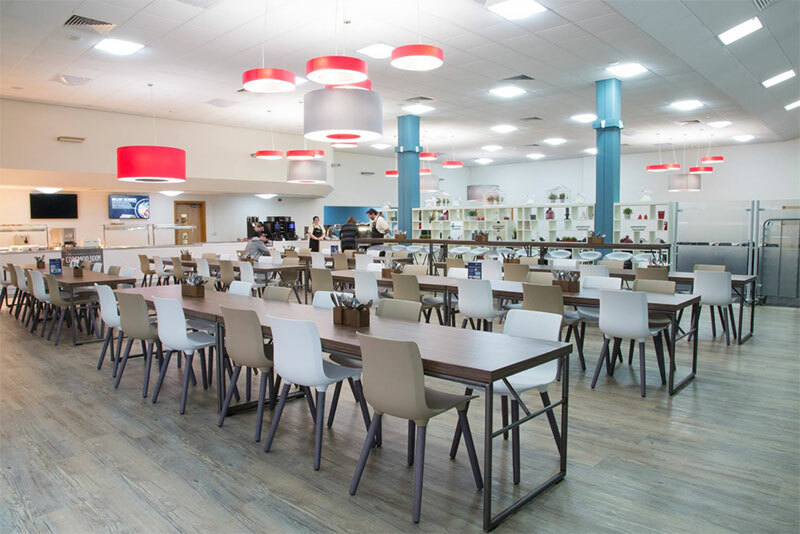 With ongoing Jurys Inn improvements to food-waste segregation, the volume of unavoidable food waste requiring processing will grow; OWl’s service can be adjusted to meet any increased volume. No odours, messy spillage nor overflows to attract vermin. BioWhale will meet our client’s growing foodwaste needs over time. Our single monthly fee includes 28 waste pick-ups per year. No up-front investment to affect other budgets. Increased opportunities to recycle non-organic waste. Eldon Square is one of the largest shopping destinations in the UK. All its unavoidable food waste is now recycled, thanks to OWL technology. intu owns and operates shopping centres throughout the UK and Spain. 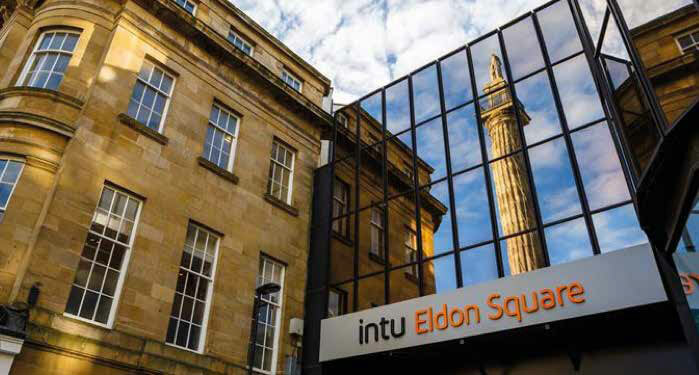 Its intu Eldon Square shopping centre is the centre piece of Newcastle’s retail offering. With an annual footfall of 35 million, it’s also one of the largest shopping destinations in the UK, and home to 20 restaurants – plus cafés, kiosks and other grab-n-go outlets. intu is mindful that commercial and industrial businesses in the UK food sector generate around 3 million tonnes of food and drink waste each year, much of which ends up in landfill. That is why the company is looking to lead by example and has been actively seeking innovative solutions to improve food waste recycling. As part of that initiative, intu trialed the OWL System at intu Eldon Square and has subsequently approved it as a food waste recycling solution for the company. Pre-OWL, intu Eldon Square restaurants placed food waste in 20 and 45-litre lidded buckets that were carried to a service area and tipped into 240-litre wheeled bins. These bins were wheeled to a central waste area and collected four times a week by conventional waste trucks. OWL installed a Standard BioWhale in the central waste area. The food outlets now deposit their unavoidable food waste into 120-litre wheeled bins which are brought directly to the BioWhale for loading. After loading the bins are washed and returned to the outlets. Collections are reduced by over 85%, taking place bimonthly. As part of the project, the total cost of OWL System was compared with alternative solutions, including all related labour costs, utilities and the impact of the cost of managing other waste streams. OWL was found to provide positive economic benefits, in excess of what was originally anticipated. The Centre’s unavoidable food waste is now 100% recycled into green energy and organic fertilizer. By segregating food waste from its general waste stream, intu Eldon Square is now better able to recycle its non-organic materials. With the entire process running under vacuum, there are no odours, spillages, or leakages to attract insects and vermin. No up front capital costs incurred. Everything is included in OWL’s cost competitive, monthly service charge. intu Eldon Square is playing an active role in reducing the amount of organic material going to landfill, enhancing its reputation as a sustainable enterprise.